One day last summer, Christian and I were under the big swinging tree in the backyard where we spied a giant of a mushroom. It was seriously h-u-g-e, unlike that piddly thing you see up there. Christian was quite excited about the strange, squishy growth that was most definitely not there the day before. 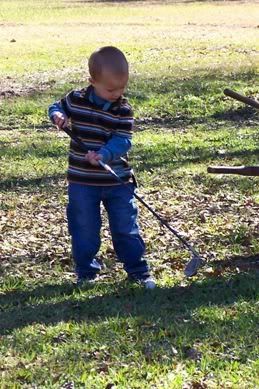 ... his favorite golf club. I wish I had a picture of him from that day. It was his last afternoon here in our earthly home. But God knew then and He knows now that maybe I didn't really need pics from that day. Perhaps I'd look back on them with sorrow instead of remembering the joys of that day? 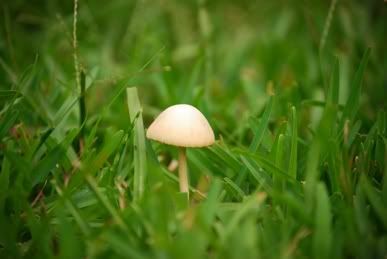 Anyhow, I can't help but think of Christian whenever I see a mushroom-- be it in the yard or at the grocery store. :-) He's the only one of the boys (including David) that would even take a taste of my homemade cream of mushroom soup. And I make good soup, y'all! Oh, before I forget, I know David would appreciate me mentioning the fact that Christian hit that mushroom steady, straight and blew it to smithereens. He had some mad golfing skillz! that really is too cute. what a precious memory! aren't you so glad you spent time with him on that last afternoon? The strength that God has given you to bear up under this gives me chills. Continue keepin' real, MarshaMarshaMarsha ~ it's the best way. As athletic as Noah is, Christian was the all star. Seriously, that boy did everything... and well.... except pedal his bike of course. :) I miss him. There's no doubt in my mind that he smashed that 'shroom to smitherines. Love you!!!!!! Now I'm going to think of Christian every time I see a Giant 'shroom too. I'll send you a picture. Maybe I'll let my boys smash it up too----in honor of Christian. The Christian 'shroom classic. i'm so glad you are able to keep pulling out these sweet memories of christian. i love hearing you talk about him even though it makes me sad. I love a few bloggers (you included) but HSB is really funky on my computer. I am so happy to visit you here. :) It's adoreable. Maybe you are right, Marsha. You know, without pictures of that day you have to intentionally think back but God is so good that He gives you little reminders, like the mushroom, so that the opportunity is always there. Keep 'em coming, girlie... I love hearing your stories about that blonde haired cutie! And my goodness, poor mushroom! Sweet memories. I hope there are many more that make you smile. Are you moving your blog here? I hadn't visited in ages and got here from homeschoolblogger. I made the switch here right before Emily died and have found it a good place to grieve and learn to live again. Fond memories...I love to read all the wonderful stories that you have! I love you dear friend and know God is using you in ways we will never know. Please continue to share.